Nestledin 10 acres of lush gardens, Club Andaman Beach Resort offers its ideal and unique settings for a private wedding or renewal of vows. 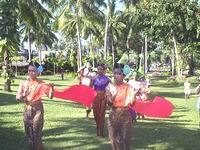 We can arrange a Floral Garden Wedding or a Traditional Thai Wedding. Our wedding planner will share ideas with you and will plan the most romantic day well in advance. The ceremony can also be arranged within a few days. Our wedding team and the management arrange your unforgettable wedding to share your wealth of happiness. When you arrive at Club Andaman Beach Resort you meet with your wedding planner to finalize the arrangements. A wedding at Club Andaman Beach Resort is not only about exchanging vows, but also a chance to show your happiness to your families and friends with a reception. Our beautiful garden with tropical trees and flowers makes a perfect background for a happy bride and there is nothing more beautiful than a happy bride. Further information, please contact to our Wedding Planner. 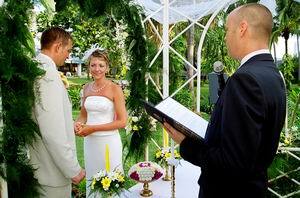 Youmay choose from a Christian Ceremony or Non Religious Ceremony. The ceremony will take for 15 - 20 minutes. Recommend time for the ceremony is 16.00 - 17.00 hours. Groom, leading the way by Long Drum Parade, and Buddhist praying ceremony starts solemnly to pray for the marriage and to give some offering to the monks. Holy Water Pouring & Bonding Ceremony will follow and our Management wish your happiness and put the holy-strings on your head, offer the garlands, and put powder marks on your forehead. Then your hand will be poured by holy water to cerebrate your wedding. The ceremony will take 15 - 20 minutes. Recommend time for the ceremony is 09.00 - 10.00 hours. Make a toast with sparkling wine, and cut the wedding cake. You may enjoy chatting with your guests. It can be a small reception. Tuk Tuk time! 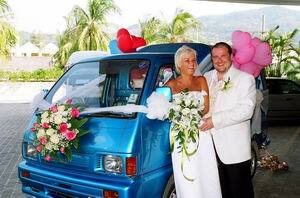 Get a "Wedding Tuk Tuk", very unique vehicle on the island, and show your happiness to many people. This Club Andaman special arrangement will remind you all the time that you got married in PHUKET! Room upgrade to Junior Suite with honeymooner decoration and room service breakfast from the night of wedding up to maximum of 3 nights, if booked in accommodation in the hotel. Room upgrade to Junior Suite with honeymooner decoration and room service breakfast from the night of wedding up to maximum of 3 nights, if booked an accommodation in the hotel. Legal Marriage - Please prepare passport, certifying letter or document of your single status from your embassy, Personal details such as your names and address, nationality, your parent's names and nationalities, & Divorce document if married before. The ceremony can be arranged on any day except some special event day. In order to organize a private wedding, the hotel reserves one wedding only per day. In case of rain, the hotel will arrange the wedding ceremony at a Function area where you can see the garden.